We realize that the storm has left a large area of the country devastated and our hearts go out to everyone who is suffering from its effects. We were lucky in the Washington, DC region to have largely escaped the brunt of this storm’s incredible force, although we did experience a lot of wind damage and closures earlier this week. One of the results of this storm is the interruption in the shipping of packages throughout the Northeast as well as other parts of the country, since the systems are very interconnected. We are working with UPS and FedEx to catch up on our incoming as well as outgoing shipments. Everything should be caught up within a few days. We know that Americans all pull together in times of crisis and we all need to be understanding as the shipping companies get back on track. Thank you for your continued support. To find out how to help after the storm, please see the CNN page HERE. 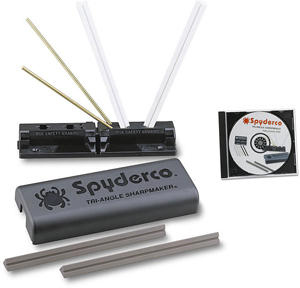 Slim, sleek, long, and natural are the first things that come to mind when handling the new Spyderco Ulize. Very similar in looks, size, and shape to one of the original Spyderco models, the C07 Police, this Ulrich Hennicke design is more than fit for duty. The Ulize was specifically designed for use by the German police as a functional utility tool as well as devastating cutter with its 4.12″ re-curved VG-10 blade. The handle melds into the hand extremely well and puts the blade in an excellent cutting position in multiple grips. 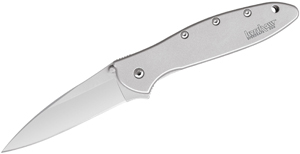 Proceeds of this knife will benefit officers killed in the line of action and the four-position clip, backlock, and trademark round-hole make this pocket knife completely ambidextrous and great for any user. Check out this new large tactical folder from Spyderco at www.knifecenter.com. If you’re looking for a decently made, economical all around camp knife that’s rugged, well built, as well as visually appealing – look no further than the Garuda by Condor Tool & Knife. Designed by Joe Flowers, an outdoorsman from North Carolina, this knife is tough enough to do it all. 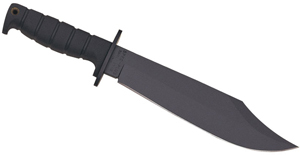 This is an economically priced, large fixed blade. Don’t look for perfection in every curve, but it is well made and sturdy. The 5″ 1075 high carbon steel blade is epoxy powder coated to assist in corrosion resistance and full tang for added strength. The Micarta handles are oversized for use with gloves or for those with larger hands and it is nicely curved and contoured to fit the hand excellently. It comes with a very sharp convex grind and ballistic nylon sheath that can be attached to your belt or MOLLE gear no problem. Check out this awesome new camp knife from Condor at www.knifecenter.com. This is a very well designed, high quality new combat knife from Jesper Voxnaes and Boker. It’s constructed from one solid piece of N690BO stainless steel with a beautiful stonewashed finish. The handle is contoured canvas Micarta with holes drilled through it allowing for the knife to be easily attached to a stick for a homemade spear. The clip point blade is an excellent tactical design that can also be pressed into hunting tasks with ease. Part of what makes a good fixed blade knife is having a good sheath and that’s definitely the case for the Boker JTN. The black leather sheath is extremely well made, visually appealing, and durable. It’s got a pouch on the front for extra survival gear and has Velcro and button attachments on the belt loop so the sheath can be put on and removed without having to undo your belt. A very nice knife from Boker that’s built like a tank and available at www.knifecenter.com.